integrate twitter with asp.net in 3 easy steps. 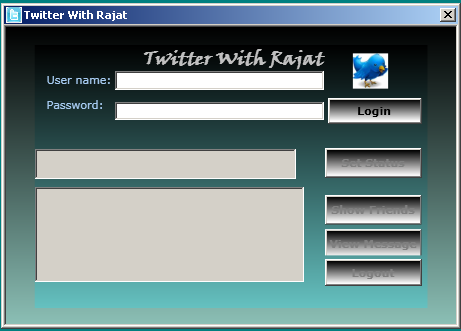 Here I am with new and very interesting topic which is how to integrate twitter with your application and more over the application is in WPF (windows application). Once you download that just copy Twitterizer.Framework.dll and past in your project’s bin folder. 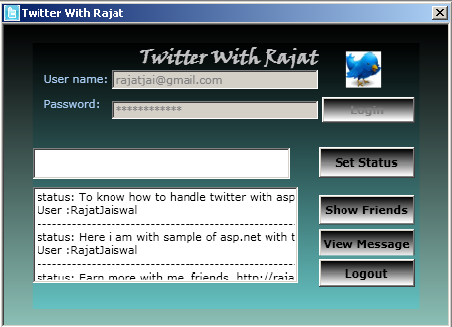 After this set reference of twitterizer.FrameWork.dll in your project. Once you done with this now everything will go smooth now. To connect with Twitter you have to write following code. Once you done with this and if any error does not come means you won half battle. Now you have to play with above object. Suppose you want to set new status on your twitter then. You have to write following code. Then you have to write following code. 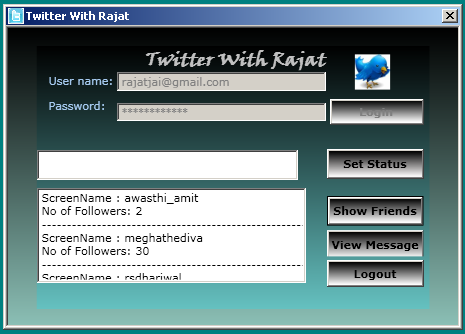 This just a sample which I tired more over you can sent direct message to user. Delete any status. Delete and friend, with this DLL. For learning purpose I used it and enjoyed a lot .I hope you like it and dig more to enjoy facility of twitterizer.framework.dll. How to find Mobile Location and provider ? Today we are going to do some interesting things which are find mobile location with dot net. Many time we got wrong number but we don’t know from where it comes with the help of this utility you are near about that location and service provider. If you are not aware of mobile number system then it is too exciting for you just like me before I started this project. Actually this utility not giving exact location but it gives the state and capital combination means near about that location you can find the mobile. To understand the project we started with Mobile Number system. The starting 4 number in any mobile number in India is pre decided by TRIA (Telecom Regulatory Authority of India). This starting 4 number is called MSC code (Mobile Switching center). This 4 number decide which provide giving his service to which area of India. Here provider means IDEA, BSNL, AIRTEL etc. As I got this information what I did I collect all the provider information first. Secondly I find all area detail of India. And last but not the least prefixes 4 digit of mobile number in different area with providers. 3) tblMobileCode table – in this we keep MSC code, lngAreaId, lngService Provider id. Once I did this. Then I inserted the data according to the need of application. I have created utility to import Excel to our Mobile Track database. Then I thought instead of showing the simple location why not we use Google map. So I used Google map to point out position. In this way we created this task. More over in next couple of week I will show you how to track your mobile’s real time position. It’s also very interesting thing. Please give you your feedback on this.